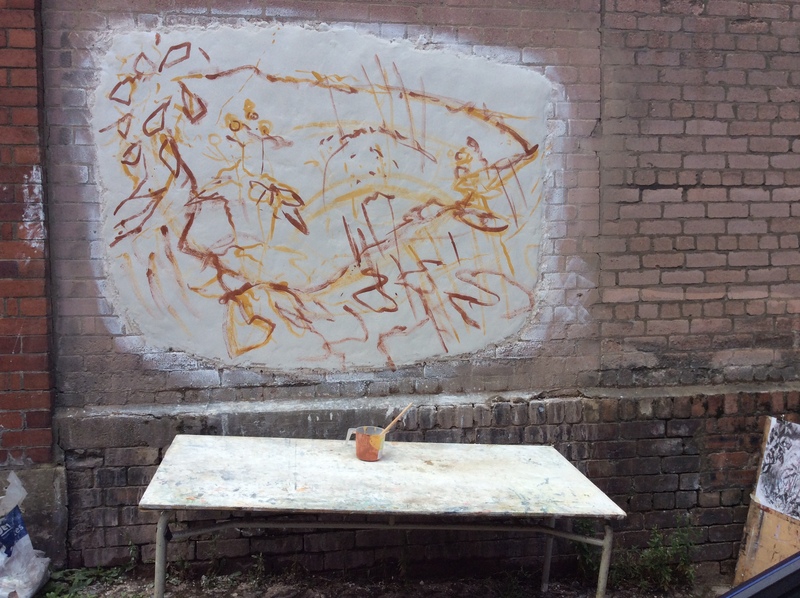 I decided to divide my fresco design into six giornate (painting days) as fresco has to be painted onto a damp plaster- and it dries quite quickly. 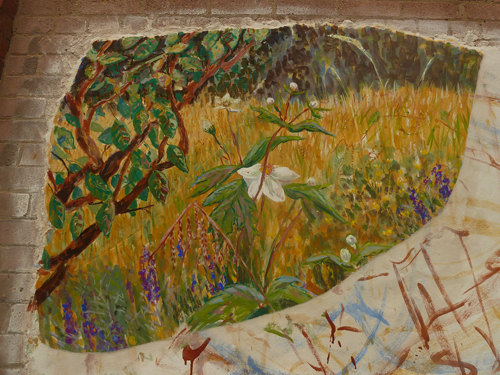 I had already done a drawing of my garden and a quick colour sketch with egg tempera on gessoed paper, to get a feel for the pigments. Traditionally, a detailed cartoon was transferred by pouncing pigment through perforations on a drawing onto the second coat of plaster. My cartoon was very loose, more of a guideline of what goes where, leaving plenty of room for spontaneity. Purists would have a fit if they saw the way I was approaching it. 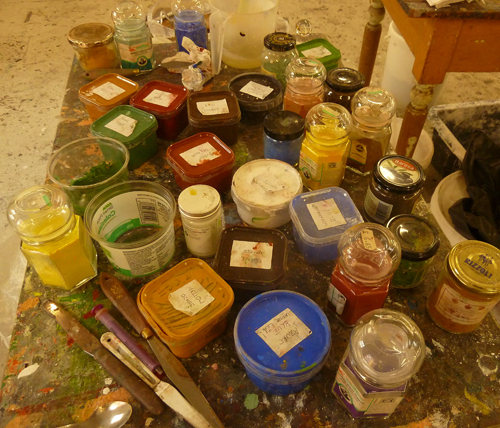 I was all set for painting the first giornata yesterday, but rain was forecast. Great, I thought, I will have a day off and rest my muscles. I went into the studio anyway, to pound out some lumps in the plaster and saw it wasn’t raining, even though the air was heavy with moisture. Standing there with the plaster ready and the design urging me on, it was hard to worry about the weather. I decided to take a chance. So what if I would have to scrape it all off- it could be a test run. The rain never came. I painted away for about three hours, then the plaster started sucking in the paint immediately and I knew my time was running out. Note to self- wet the previous layer a lot more in future. Whilst painting, I was called upon to be a car park attendant and a delivery adviser. I even had a visit from an Italian photographer who was just out for a wander. It really is a very busy lane. So, would it rain the next day? No, I was lucky again today. 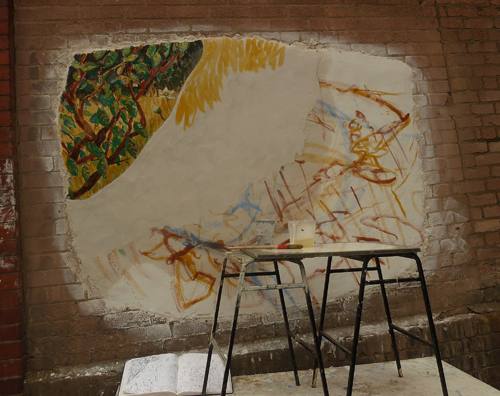 This time I plastered a larger section and now think I can paint the fresco in five sections. Despite the long and laborious preparation, I paint quickly and spontaneously. 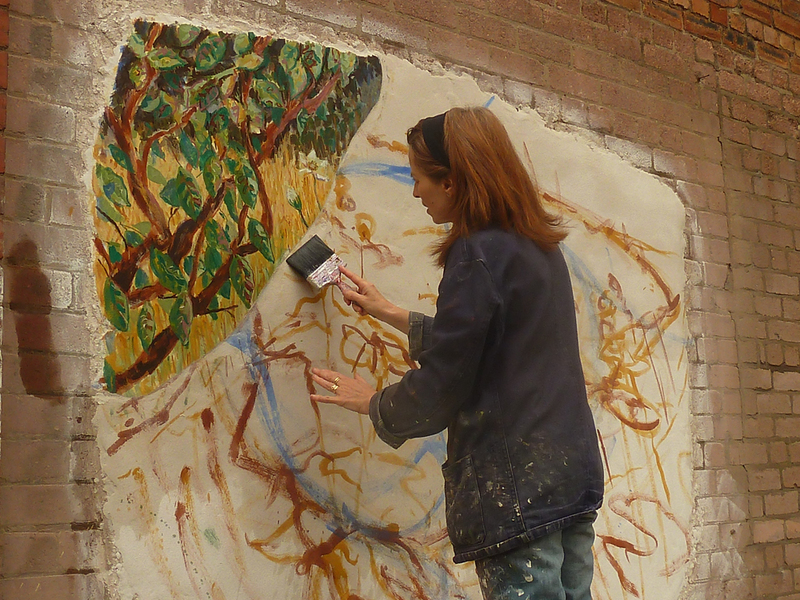 In fact, I think the physical nature of the preparation- wetting the surface, mixing the paints, preparing and applying the plaster helps the painting brew inside of me. I had interesting conversations today with some cleaners, a Jordanian student and a surveyor who was taking his mum out for tea.